Knights of Omega Delta Phi are instilled with the ideal that they can change the world through hard work. Programs such as our “Young Knights Leadership Academy” have won various awards and recognition. We also work with organizations such as the Boys and Girls Club of Austin and the Longhorn Service Council to hold large-scale events that bring our communities together and serve society as a whole. Along with our nationally recognized Young Knights program, many chapters have been honored for service such as tutoring, mentoring, and environmental projects. Here at The University of Texas at Austin, we have a strong tradition of service to our communities. We strive to excel in every field of human endeavor, setting the example and creating new standards for our fellow students. Some of our Brothers are members of organizations that also serve the community. CASA volunteers are appointed by judges to watch over and advocate for abused and neglected children, to make sure they don’t get lost in the overburdened legal and social service system or languish in inappropriate group or foster homes. Volunteers stay with each case until it is closed and the child is placed in a safe, permanent home. For many abused children, their CASA volunteer will be the one constant adult presence in their lives. Brothers will have the opportunity to support their local CASA program through various service and fundraising efforts. 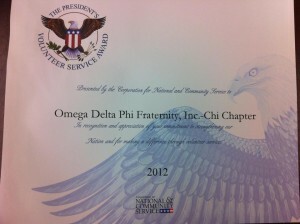 We are Proud of earning the President’s Volunteer Service Award every year since 2011. This award is granted through the Volunteer and Service Learning Center (Longhorn Center For Civic Engagement) for volunteering 2,000+ hours to the Austin community. There aren’t many organizations, let alone fraternities that are dedicated to service like Omega Delta Phi.